IAM has partnered with FXcompared to help you and your clients process international payments. By working with FXcompared, you can save money when sending or receiving payments in a foreign currency. FXcompared provides a gateway to the leading payments providers from around the world. FXcompared also offers a full white label solution, allowing you to enhance your offerings to your international relocation clients by providing them with a valuable service, as well as an additional revenue stream for you. Tel: +44 (0) 207 871-5565. Or email us at iamovers@fxcompared.com. 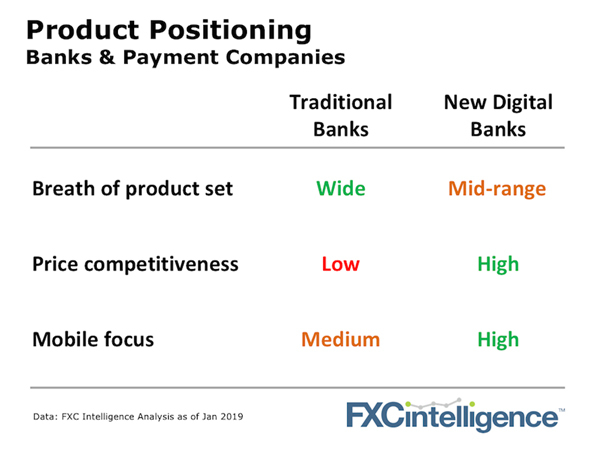 Whilst the new digital banks (Monzo, Starling, N26 and others) have been grabbing the headlines with their top line growth, they have also been putting in place formidable payment offerings. Backed by venture money and a target to simply grow, they have made it into our market share data and therefore onto our radar. These new digital banks accounted for 5% of UK consumer money transfer in 2018, according to research we provided for the FCA last year. A year before, they didn't even register. Banks own the customer, but digital banks now own millions of customers too. Digital banks are still focused on customers not revenue, so pricing can be very aggressive. Monzo and N26 have simply plugged TransferWise into their product with no additional markups. Starling Bank, after flirting with TransferWise, decided to build its own payment product, albeit with a similar pricing structure. Traditional banks still have the widest range of services but the new digital banks have their own customer hooks. Deposit or savings accounts, loans, and mortgages are currently enough to pull millions of new customers in. Since digital banks are the newest kids on the block, they are unencumbered by historical tech debt and are inherently more mobile friendly and tech forward. That only helps when it comes to user experience. Does a low price = a high customer rating? 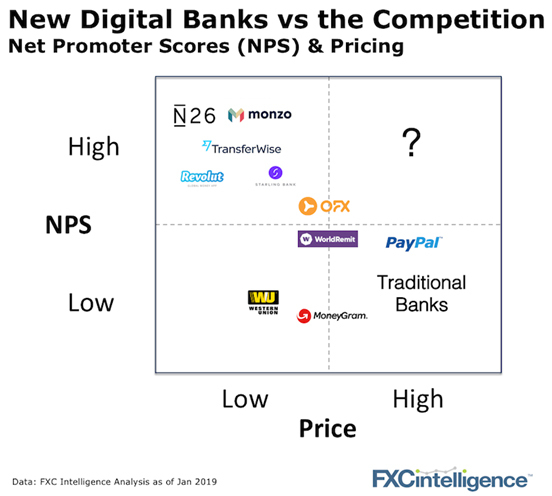 The only players in the market who have Net Promoter Scores close to fintech's like TransferWise and Revolut are the new digital banks. Monzo claims to have an NPS above 80, which would be in line with TransferWise and Revolut (according to our NPS data). Is it possible to have a service loved by customers and charge a premium? For commodity products like international payments, the positioning of key players in the market suggest if it is possible, no one has yet figured out how. Some groups such as OFX (make sure to read our recent CEO interview) and WorldRemit are maintaining relatively high prices and strong but not top-end NPS scores. The question is where they go from there. The big brands (PayPal, major banks) leverage their trust and awareness to price at a premium level. And interestingly, will Western Union, who are becoming much more price competitive see a bump in their customer love or do they retain too much historical baggage? We're here to help you make sense of the banking and payment systems, and much more - get in touch, and FXCompared will help you assess the opportunities. FXcompared is the leading, independent global resource on international money transfers. FXcompared offers a choice of carefully selected, cost aware and efficient ways to transfer money abroad. As a financial decision maker who regularly sends and/or receive international payments, you already understand the importance of a proactive currency strategy for companies that do international business. No matter how well planned, all currency strategies need to be revisited and reassessed on occasion. Fortunately, FXcompared can provide assistance not only in analyzing currency strategies, but in ensuring that financial decision makers get the fairest international transfer rates possible with a provider that best suits their needs. Stay competitive in the space of international moving by offering your clients our white label comparison tool. Our service will help your clients save money on their international payments and can also help them learn more about mitigating currency risk in the future. To learn more, visit the FXcompared website. Those working with a currency provider vetted by FXcompared typically save close to 90% on fees and exchange rates compared to automatically transferring through a bank. How do I use FXcompared? Select an amount and a destination, choose a provider from the search results and create an account on their website. What currencies can I compare? There’s a full range of currencies, covering 126 countries. How does FXcompared assess each money transfer provider that it lists? Providers are carefully vetted. After ensuring that providers are approved by governing entities, we assess their business practices. This includes the amount of currencies offered, speed of transfer and availability of other currency products to clients. After all of these things are taken into account, FXcompared then decides whether or not to include the transfer company on our list of providers. Can I transfer money online, or do I need a phone? All the brokers listed have an online service with 24-hour access, where you can track your transfer and view all of your transactions. Some also offer a phone service. Are these providers properly regulated? Yes, all the providers listed are regulated by the relevant financial bodies in the countries or other regions where they operate. Can the international payments provider offer other services? Yes. Some can help with property purchases or with other specialty business services. Can I offer this service to my clients? Why might it cost less to transfer money via a currency provider than through a bank? The exchange rate between currencies changes all the time. To combat unexpected movement of different currency pairs, some banks set a higher exchange rate that is fixed for the day. Because currency providers typically move with the market and change their offered exchange rates throughout the day, they usually offer better exchange rates to their customers than banks. Additionally, currency providers can offer better exchange rates and lower fees to their customers simply because they have lower cost bases than banks. It's easy—and cost-effective—to reach thousands of executives and decision-makers at moving, storage, logistics, and related companies worldwide by advertising in The Portal, the industry’s premier publication. Published six times a year, the magazine provides news and updates on the people and companies who comprise the IAM membership, and issues that concern industry as a whole. Advertising opportunities are available ONLY to IAM member companies. Get more information, including advertising costs, specifications, and deadlines.